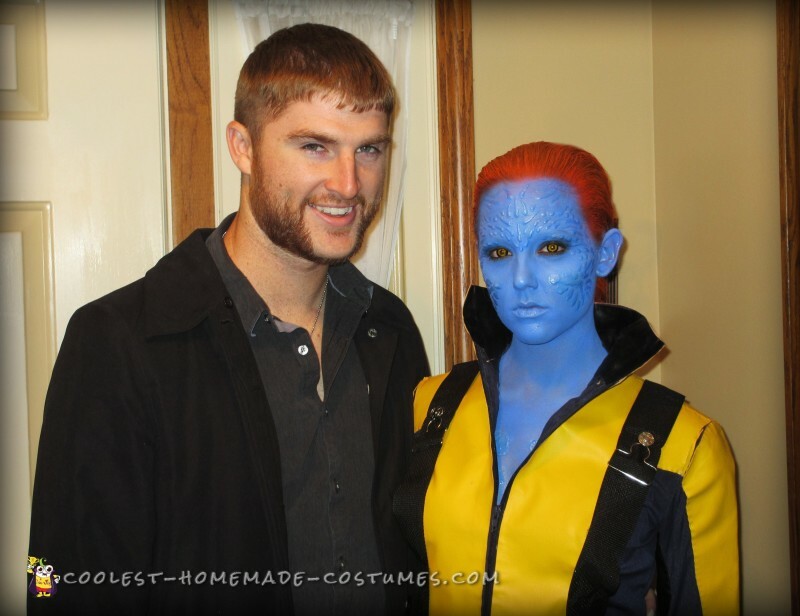 My name is Katie Eastman and this year I transformed myself into Mystique from X-Men First class for Halloween! I have always been inspired by special effects makeup and love to watch shows like FaceOff on Syfy that show how makeup artists bring characters to life. I also quite enjoy watching movies and figured I’d try a little movie magic myself! 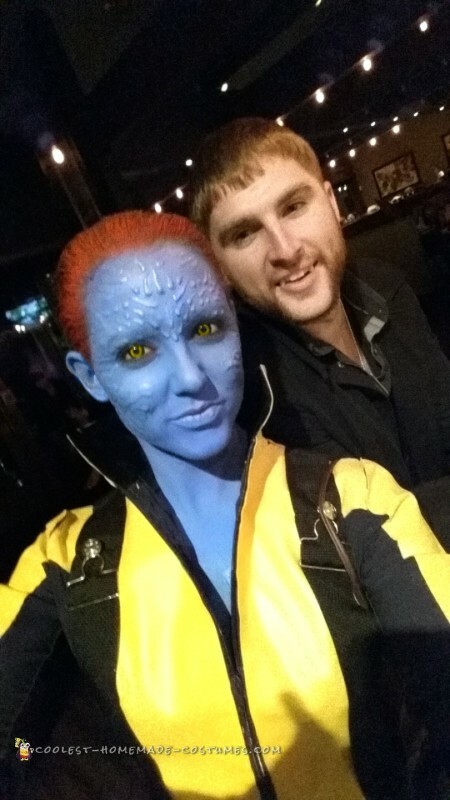 I decided to become Mystique because of her character and unique abilities. Her features are also distinct and her scales seemed like a fun challenge to create. Although her main form is an unclothed scaled body, I didn’t want to be too revealing or have to create a full body spandex suit. 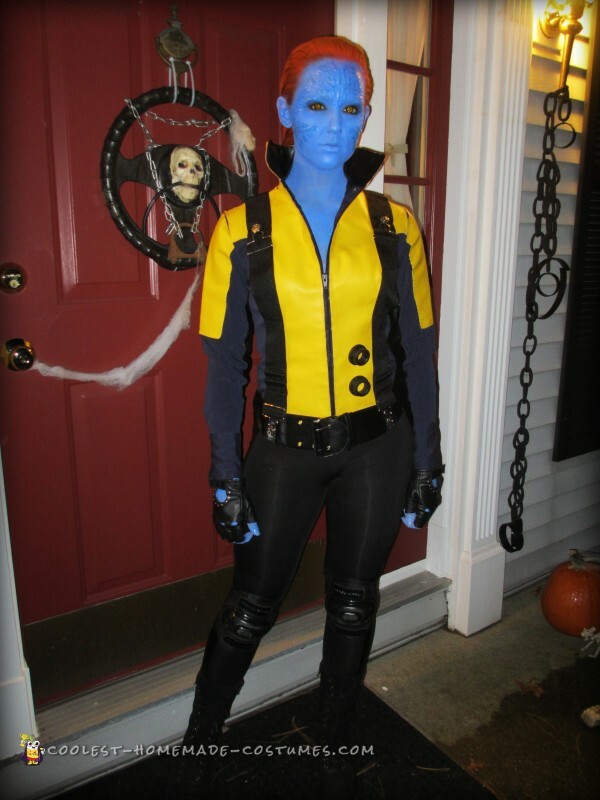 Therefore I decided to become Mystique from X-Men First Class where the mutants wore uniforms. 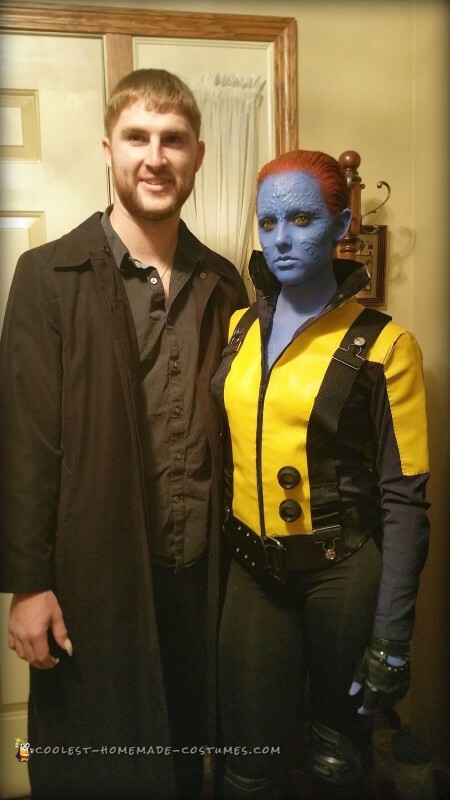 This was my first attempt at creating facial prosthetics, sewing a costume, and a full face/hair painting. Along with these, I wore leggings, gloves, black boots, and skate knee pads that I already owned. The first thing I did was remove all the buttons off the navy dress shirt that I got from Goodwill. 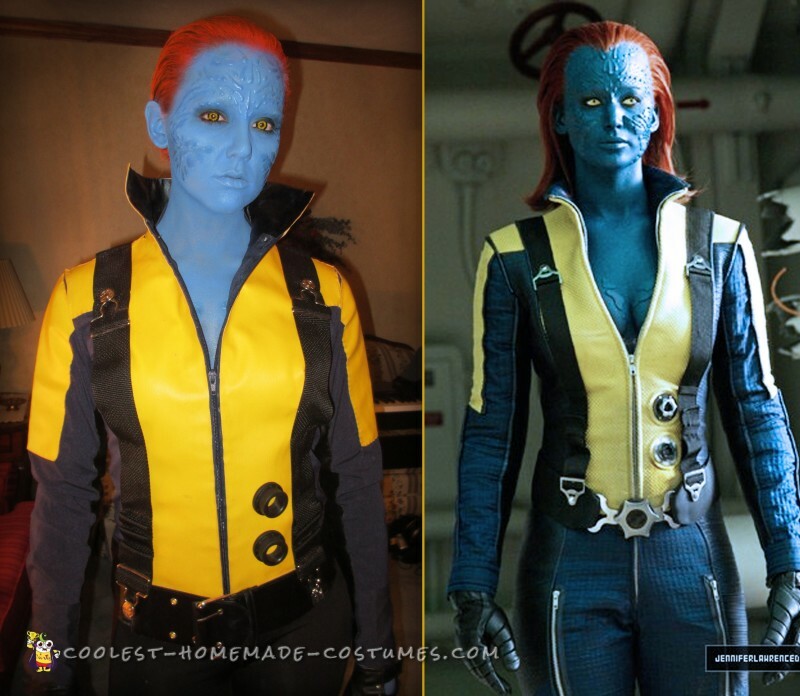 With a sewing machine I then sewed a zipper in their place to mimic the mutant uniform. I then laid out the dress shirt and started to draw out the sections of yellow and black fabric with a white colored pencil. This included areas on the chest, back, shoulders, arms, underarms, collar, and sides. From here it was trial and error with measuring, cutting, and fitting the pieces into place. I have never sewn my own costume before so I was learning as I was making. One thing I tried was using wax paper to cut and figure out the forms to be used as stencil for the real fabric. This worked well along with tracing the forms while I was wearing the shirt –a manikin would have been nice. I then glued the pieces on to their corresponding areas with fabric glue and then proceeded to sew every edge by hand. It’s safe to say I needed a thimble when pushing a needle through thick vinyl. Ouch! This helped secure the edges as well as give it a tailored look. I then took an old belt and cut it to match the bottom black band I sewed onto the shirt. Using a hot glue gun and a needle and thread, I attached the belt to the front of the shirt along with two rubber accessories. Finally I sewed on the nylon straps and hammered in the overall buckles that were looped in the nylon straps. For my makeup I started with liquid latex and used the end of a paintbrush to apply it to my face. Slowly but surely I painted the scales on my face in multiple layers until they were thick enough. 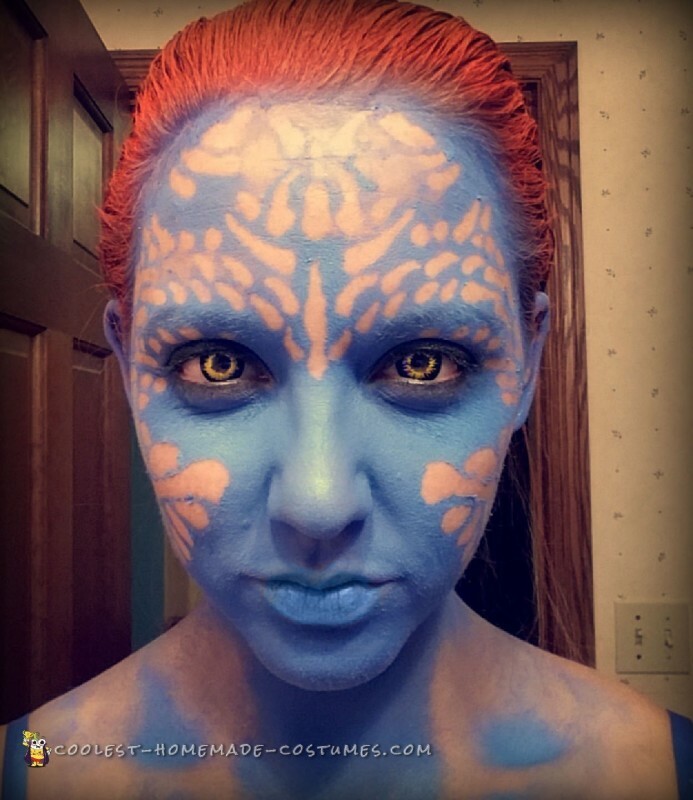 After this I used an airbrush and based my face and chest in blue Kryolan makeup. I then used black and white airbrush paint along with my own personal eye makeup etc. to highlight my facial features. The airbrush kit was a Christmas gift from my brother and I wanted to make him proud with what I created with it. Once I covered myself in a makeup setting spray, I then sprayed my hair red. Finally after putting in my contacts and getting dressed my character was complete! I was proud of the result and hope you enjoy it as well. 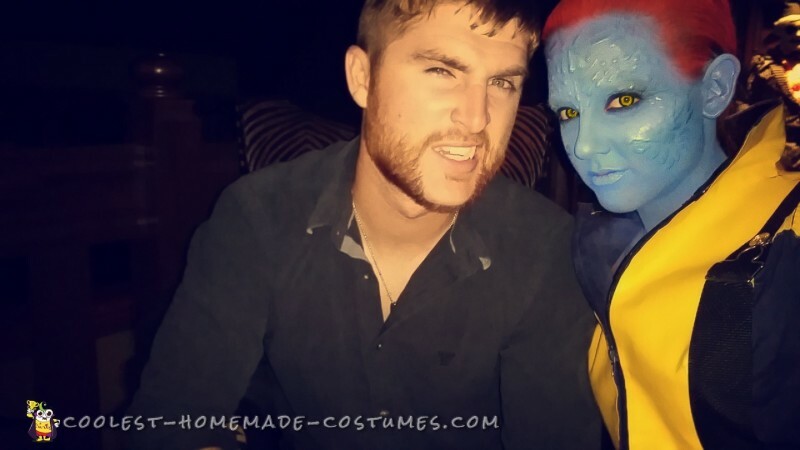 I had a blast on Halloween getting into character and hitting the town with my boyfriend, Luke, who dressed up as Sabretooth from X-Men complete with fangs, claws, dog tags and trimmed facial hair. 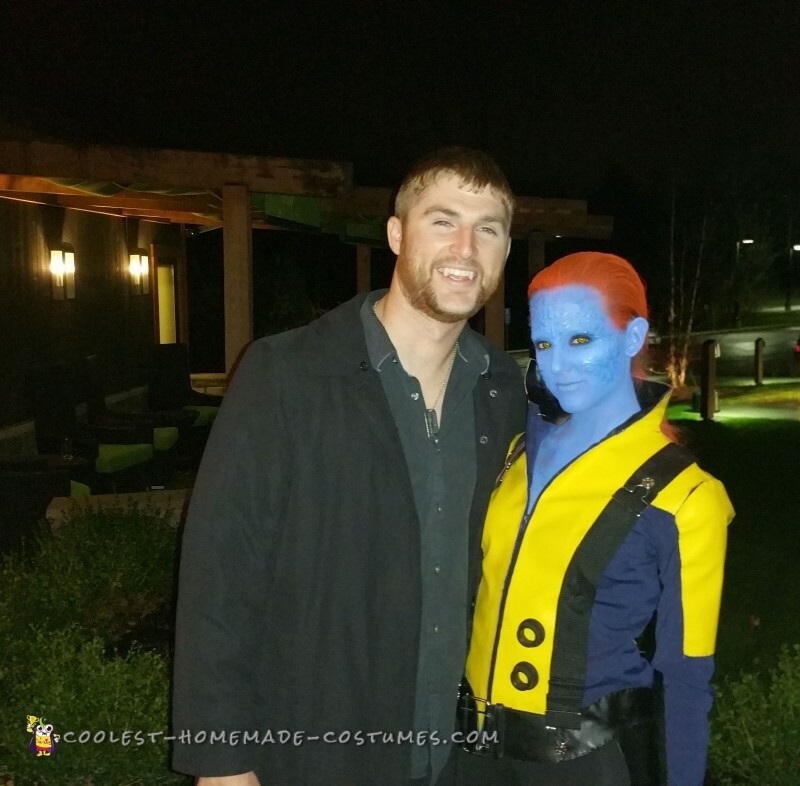 Together we were mutant and proud! I received much praise from others who showered me with complements. I even had multiple people ask to take pictures of me! It made me so happy to know I was bringing joy to others and that my hours of work were well worth the result. I couldn’t stop smiling the entire evening and wished it wouldn’t end! 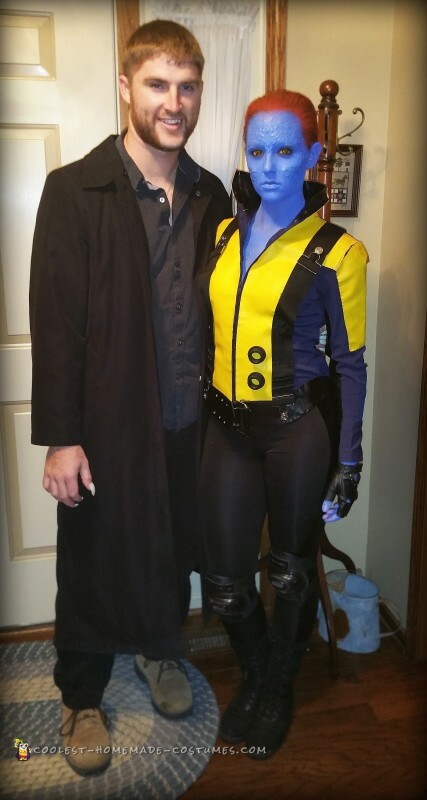 I definitely plan on making this a tradition and want to learn more costume creating techniques for years to come!